For a photo-essay that celebrates the finest in nature photography, the viewers may be forgiven for wondering how we allowed this image to pass without that most basic of photo editing techniques: red-eye correction! They could also be forgiven for wondering if the Editor had a bad case of ‘red eye’ syndrome after a late night out, and missed something so obvious. In fact, millions of citizens of rodent-land will also be forgiven for wondering why God didn’t provide an auto red-eye removal facility, not just from the image, but from the seemingly serene canopy of sky above them. For it is from up above that nemesis often comes hurtling down, ruthlessly whittling away at their population with frightening efficiency. 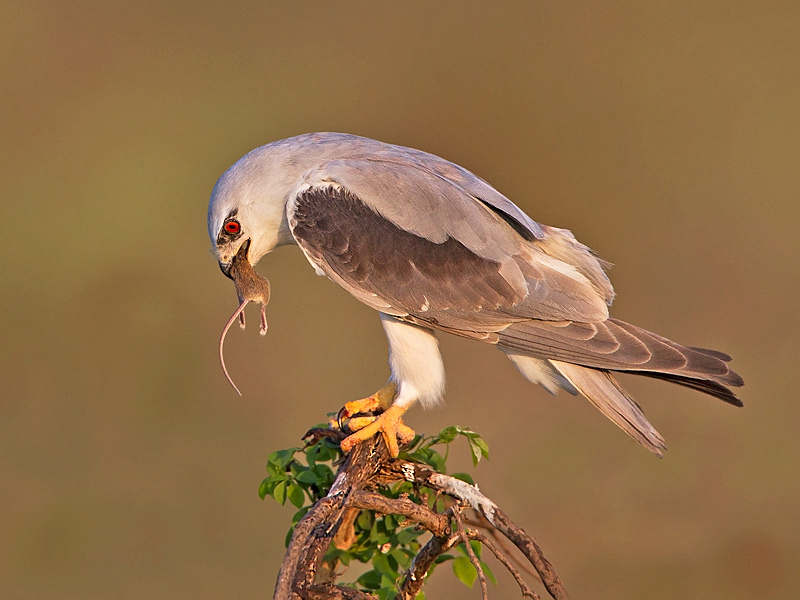 Much like Blackbeard, the legendary pirate of the Caribbean, the Black-shouldered Kite or ‘Red Eye’, is the scourge of the field mice and rodents of Kabini. A small yet powerful raptor with black shoulder markings on a predominantly grey-white plumage, this Kite’s trademark is its bloodshot eyes that you wouldn’t want fixed on you, especially if you’re small and furry, and furtively trying to negotiate an open space between you and the sanctuary of a dark alley. If you’ve learnt your mouse lessons well,you’ll not tarry or flutter your eyelashes when you hear a clear, piercing whistle. Before you can turn to see who’s appreciating your dishy new hairstyle, you’ll be well on the way to becoming the dish of the day for a hungry Kite! For those of us who’re unafraid of being eaten, the sight of this Kite hovering almost vertically at dawn or dusk, before dropping on its prey like the silent crack of doom, is a reaffirmation of the majesty of creation. And, if we’re very lucky…and very, very, good with our cameras, we can click the kind of picture that’s featured here. Red-eye included! We at Orange County have loved sharing this story with you, and shall bring you one every fortnight, as part of our Responsible Tourism Initiatives to raise awareness about the nature and culture of the environments we operate in. This entry was posted on Wednesday, April 4th, 2012 at 7:19 am and is filed under Birds . You can follow any responses to this entry through the RSS 2.0 feed. You can leave a response, or trackback from your own site. Excellent Pic.Timing, Angle everything is perfect.Great Job.Love it! Yes! Kiran is the King of Raptors! The write up is brilliant as usual! It’s a different experience to read the text along with the beautiful picture! Excellent picture and information sharing. Keep it up. I Must Congratulate Mr Kiran Poonacha for this Prize Catch. Nature is phenomenally fascinating and wonderful. Thanks for this beautiful picture. Absolutely brilliant – riveting stuff!